Daryl and Sue Hill are turning pink! And not from the ravages of our early summer sun. Daryl and Sue are the owners of Golden Bay Contracting Ltd, and are the force behind the appearance of 100 bales of pink-wrapped baleage alongside SH60. These bales are being generously donated for auction at the Golden Bay A&P Show on 17 January 2015. All proceeds will go toward assisting breast cancer survivors in Golden Bay. We’re thrilled that the Nelson Regional Breast & Gynaecological Cancer Trust has been asked to be responsible for distributing the funds to worthy applicants in the bay. Daryl and Sue were inspired to embark on this project when their Canterbury packaging supplier purchased a limited run of pink wrap to raise awareness of breast cancer in rural communities. A percentage of every roll purchased goes to the Louise Perkins foundation, a charitable trust that operates under the name ‘Sweet Louise’ to improve the lives of New Zealanders living with secondary breast cancer. Daryl and Sue leapt at the opportunity to support this venture and also raise awareness in the Golden Bay community. 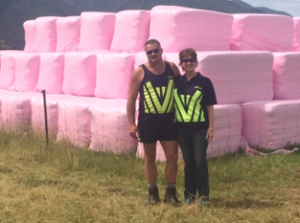 They purchased $1,000 of pink wrap, and cut, baled and wrapped grass from their lease block to produce 118 bales which they carted and stacked alongside SH60 on the Takaka Valley highway, with the kind permission of property owners, Gavin and Jane Petterson. The bales are stacked at 3 separate sites; a stack of 9 bales is located at either end of the ‘Burnt Section’ (8 green and 1 pink to denote the 1 in 9 women who are victims of breast cancer), and halfway along the ‘Burnt Section’ is a third stack consisting of 100 pink bales which will be auctioned at the show, with all proceeds donated to NRBGCT. All farmers and small holding owners are encouraged to attend the auction at 2pm on A&P show day at the GB Contracting site to support this very worthy cause. If unable to attend, absentee bidders can submit their registered bid to GB Contracting at goldenbaycontracting@xtra.co.nz or phone 525 9193.